Help! How can I get my guns back from the police? There were four officers who said that they were taking my guns and certificate for “safe keeping”. The guns were under lock and key, as usual at my home address. Since then I have contacted the firearms department four times to ask when my guns will be returned. Each time, promises are made to contact the relevant department on my behalf, but nothing ever comes of it. My local firearms officer came to see me six weeks ago and says that I will get them back. No crime was ever committed, or a breach of security. Can you clarify where I stand now. I feel that through no fault of my own, the police have been heavy-handed and are holding my property (some £15,000 worth) without good reason. What can I do to have it returned to me? HOW CAN I GET MY GUNS BACK FROM THE POLICE? It’s very easy, and quite common, for a woman who thinks she has been wronged to create problems in this way. If you’re a member of BASC, Countryside Alliance or the National Gamekeepers’ Organisation I suggest you get in touch with their firearms folk. I have lost track of the number of times I have advised joining a relevant shooting organisation but all too often my advice falls on deaf ears! 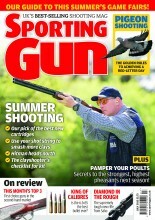 We in Sporting Gun can only offer generic advice and you need more than that at the moment. If you’re not a member of a shooting organisation you need a lawyer who understands these things – the local solicitors may have insufficient experience. Try www.shootinglaw.co.uk or lewisnedas.co.uk or www.knights-solicitors.co.uk all of whom have experience in the field.